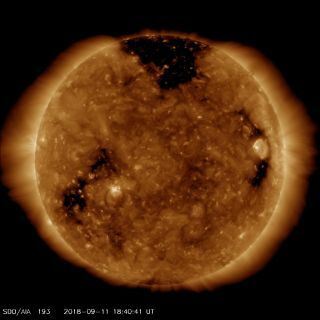 NASA's Solar Dynamics Observatory spacecraft captured this image of a giant hole (dark patch at top) in the sun's outer atmosphere, or corona, on Sept. 11, 2018. A moderate geomagnetic storm made flickering auroras visible to skywatchers as far south as Minnesota and Wisconsin early this morning (Sept. 11), according to Spaceweather.com. That storm was triggered by an especially potent and fast-moving burst of solar wind — the stream of charged particles flowing constantly from the sun — which escaped through a gaping hole in the sun's outer atmosphere, known as the corona. The northern and southern lights result when such particles slam into molecules high up in Earth's atmosphere, generating a glow. Earth's magnetic field channels these particles toward the planet's poles, which explains why the auroras are usually restricted to high latitudes. But special circumstances — such as coronal holes and giant explosions of solar plasma called coronal mass ejections — can extend the intensity and the reach of these dazzling light displays. A moderate geomagnetic storm brought the northern lights within sight of skywatchers as far south as Minnesota and Wisconsin in the early morning hours of Sept. 11, 2018. The geomagnetic storm responsible for this morning's ramp-up is now subsiding, Spaceweather.com reported. But there's still a 70 percent chance of minor storming through tomorrow (Sept. 12), according to forecasters with the National Oceanic and Atmospheric Administration's Space Weather Prediction Center. So, look up tonight if you live in the upper Midwest, New England, the Pacific Northwest or somewhere else along similar latitude lines — you may just get lucky!